Wind energy is now the world's fastest growing energy source. In the past 10 years, the global wind energy capacity has increased rapidly. The installed global wind power capacity has grown to 47.317 GW from about 3.5 GW in 1994. The global wind power industry installed 7976 MW in 2004, an increase in total installed generating capacity of 20%. The phenomenal growth in the wind energy industry can be attributed to the concerns to the environmental issues, and research and development of innovative cost-reducing technologies. Denmark is a leading producer of wind turbines in the world, with an almost 40% share of the total worldwide production. The wind energy industry is a giant contributor to the Danish economy. In Denmark, the 3117 MW (in 2004) wind power is supplied by approximately 5500 wind turbines. Individuals and cooperatives own around 80% of the capacity. Denmark will increase the percentage of energy produced from wind to 25% by 2008, and aims for a 50% wind share of energy production by 2025. Wind technology has improved significantly over the past two decades, and almost all of the aspects related to the wind energy technology are still under active research and development. 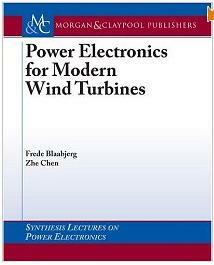 However, this monograph will introduce some basics of the electrical and power electronic aspects involved with modern wind generation systems, including modern power electronics and converters, electric generation and conversion systems for both fixed speed and variable speed systems, control techniques for wind turbines, configurations of wind farms, and the issues of integrating wind turbines into power systems.